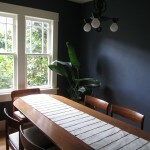 As you may remember, a couple of weeks ago I shared some plans for painting my dining room. 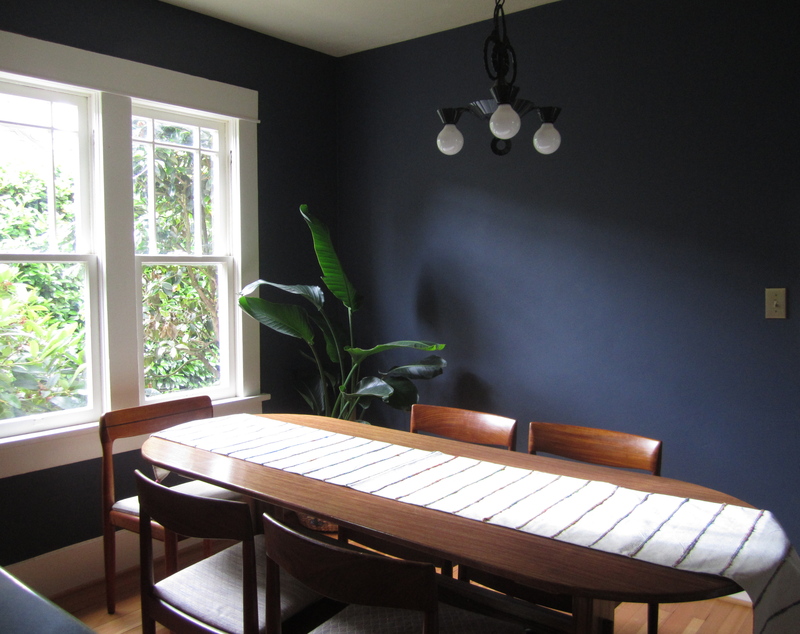 I had hung swatches of four different Benjamin Moore paint colors, and spent more than a week staring at them in different light and from different angles (thanks to Mera for pulling double post duty last week while I deliberated!). I stared until my eyes crossed and I couldn’t remember a color that wasn’t blue, but still I couldn’t pull the trigger. They were too green, too blue, too dark or too light – nothing was feeling quite right. The color I chose is Nova in Miller’s Evolution line – I decided on the ‘wipeable matte finish,’ and I love the soft sheen. The way it catches the light makes it look almost like clay. 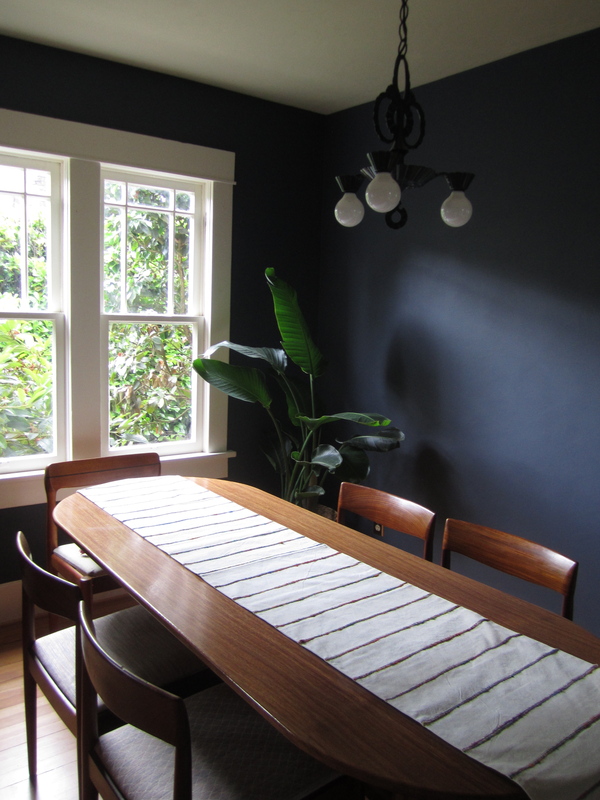 Choosing to use this paint was kind of a leap of faith – I usually do a lot of online research to read reviews and see images of the colors I like used in actual rooms. There isn’t very much information available for Evolution paint and – to make it a little more challenging – they don’t sell small sizes of this particular paint formula. 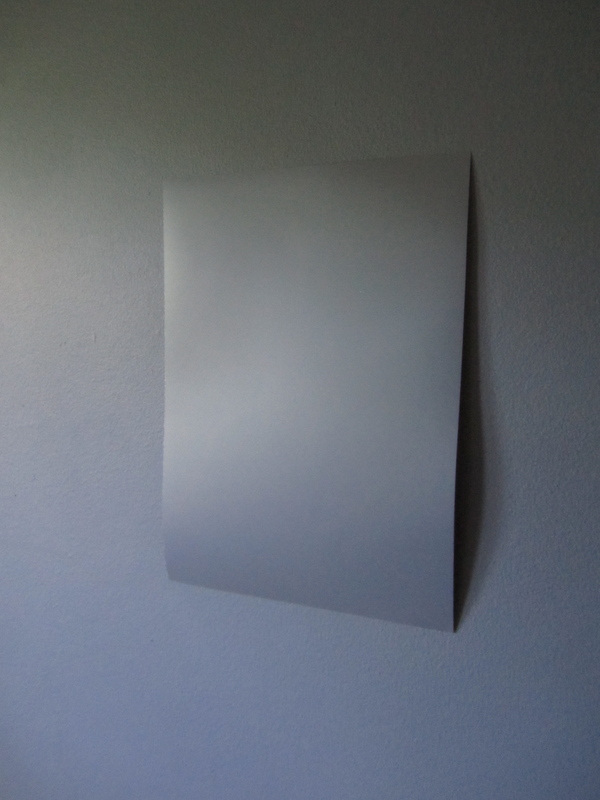 What they do have, for $1.99, are 8 1/2″ x 11″ sheets that the color is actually painted on (not printed like regular swatches). I was leery of the accuracy, but in this instance at least the swatch gave a very true representation of the color. 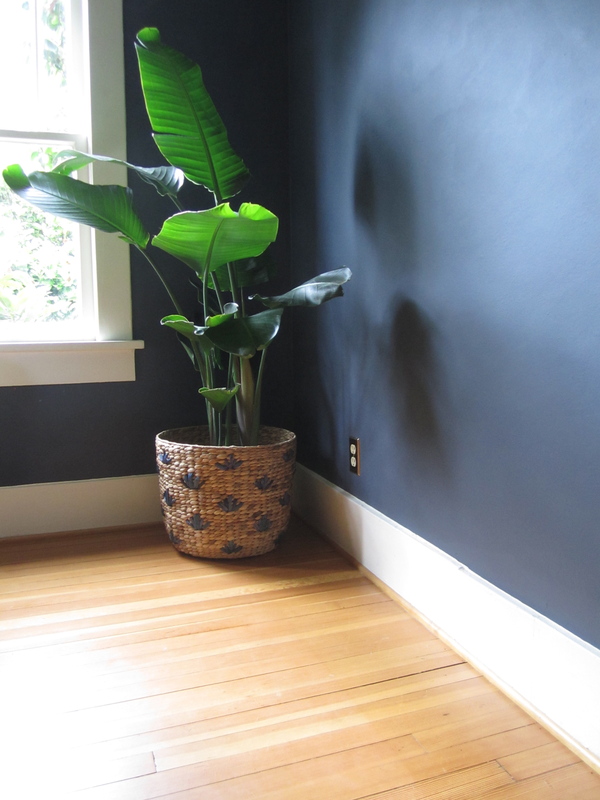 The paint isn’t cheap – $50 a gallon – but is less expensive than Benjamin Moore’s higher quality lines, and I gotta say that the consistency and coverage of this paint is incredible. Does that sound like hyperbole? Like an advertisement? Don’t worry, no one is paying me to write this; I honestly loved using this paint. It’s thick like yogurt, has almost no smell, and it took just over half a gallon to put two thick coats onto my dining room walls. Remember that time RHW reader Carol called me a Chair Champion in the comments? Well I do, fondly and frequently, and I’m doing my best to be deserving of both the moniker and the unitard emblazoned with CC I plan to make. 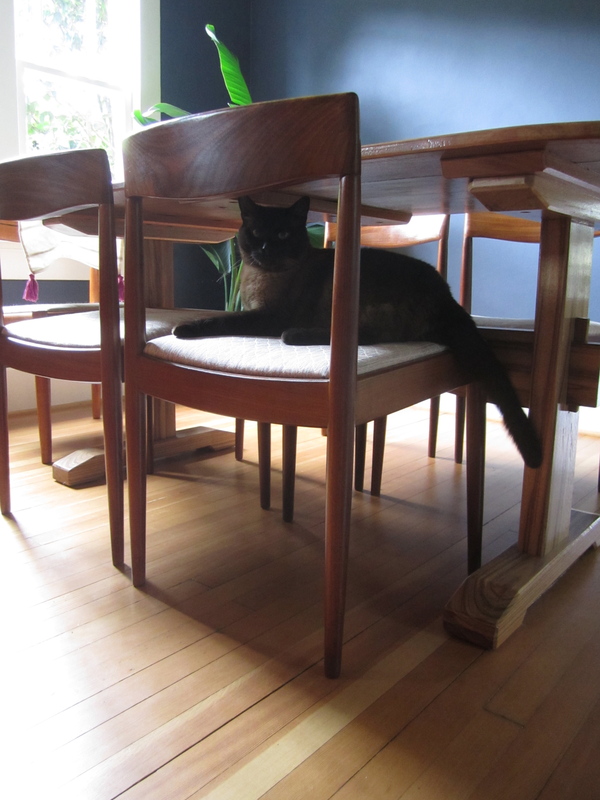 On that note, I was so excited to find these four mid-century teak chairs on Craigslist last week! 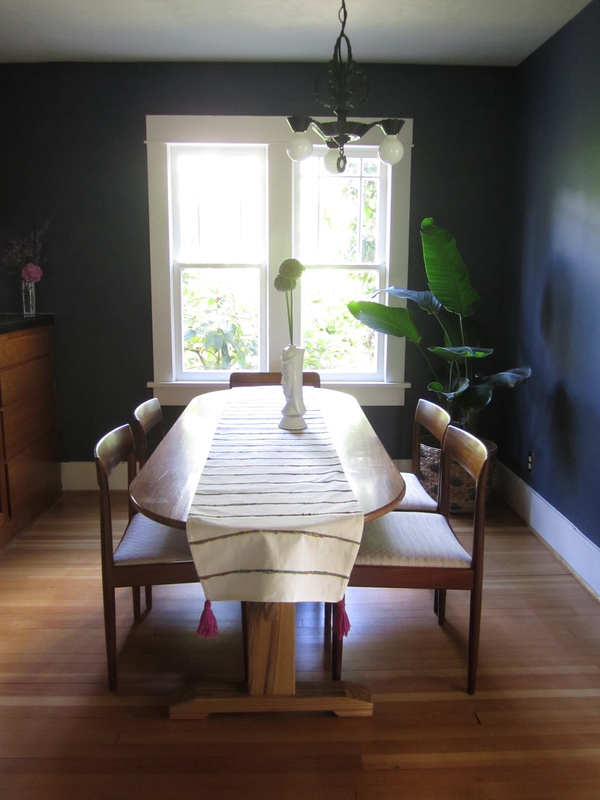 They go beautifully with the three Bramin chairs I already had – their legs are similarly shaped and they are broad-beamed and comfortable – and that wood grain… be still my heart. 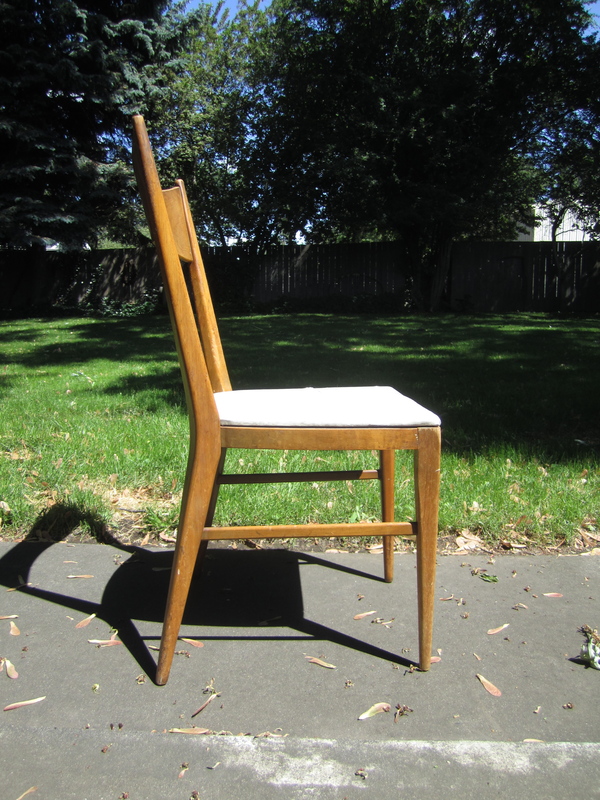 The chairs don’t have any kind of manufacturer’s mark on them, but I found some pictures of these similar ones (the only difference is the way the back is attached). My guess is that my chairs may be knock-offs of that designer, but I’m not sure. 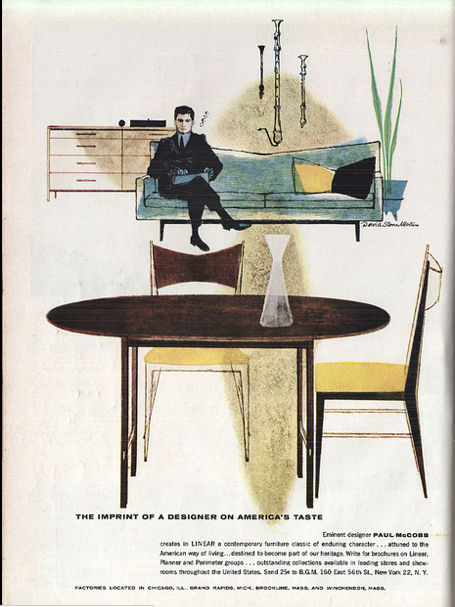 Someone really needs to make a dichotomous key for mid-century modern chairs with characteristics like type of wood, shape of back, etc. If something like that already exists, or if someone has found a good, comprehensive source for identifying mcm designers, I’d love to hear about it in the comments! 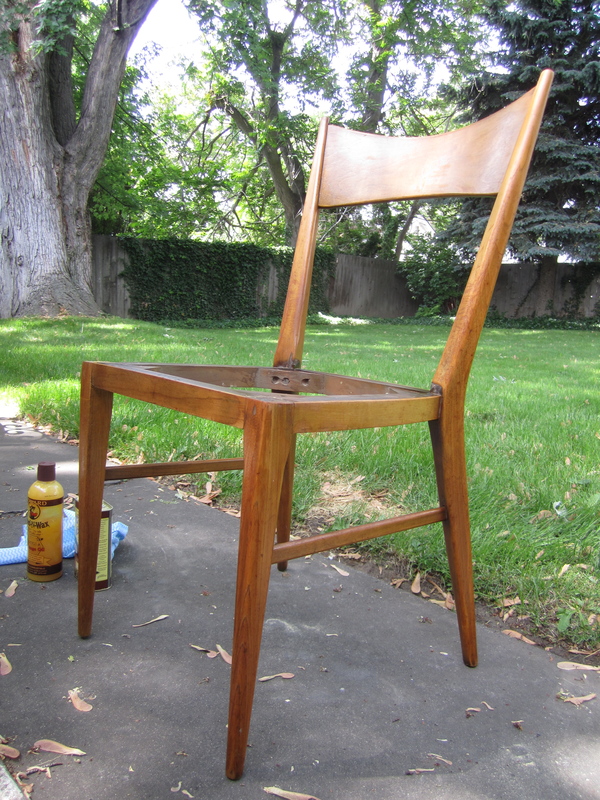 The chairs are in really good shape, with only a couple of dings in the wood. 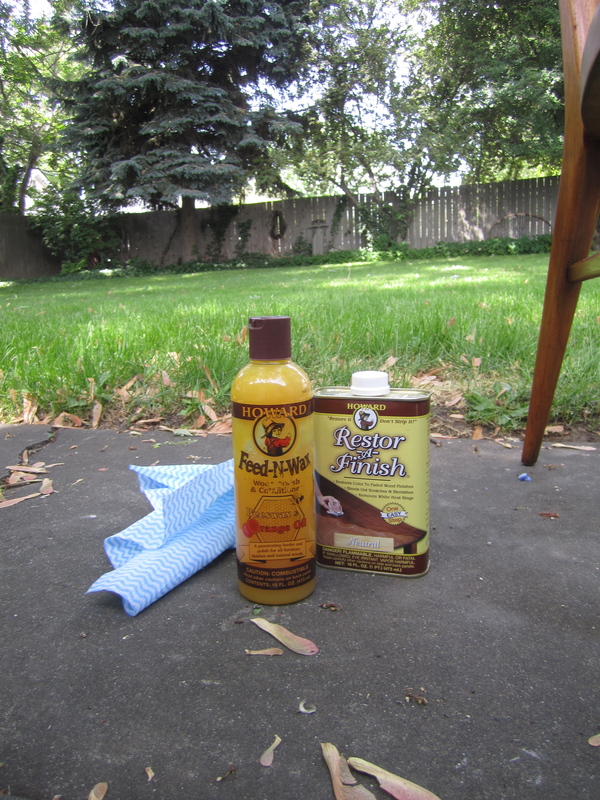 I washed them with Murphy’s wood soap and rubbed them down with neutral Restor-a-Finish and Howard’s Feed & Wax. 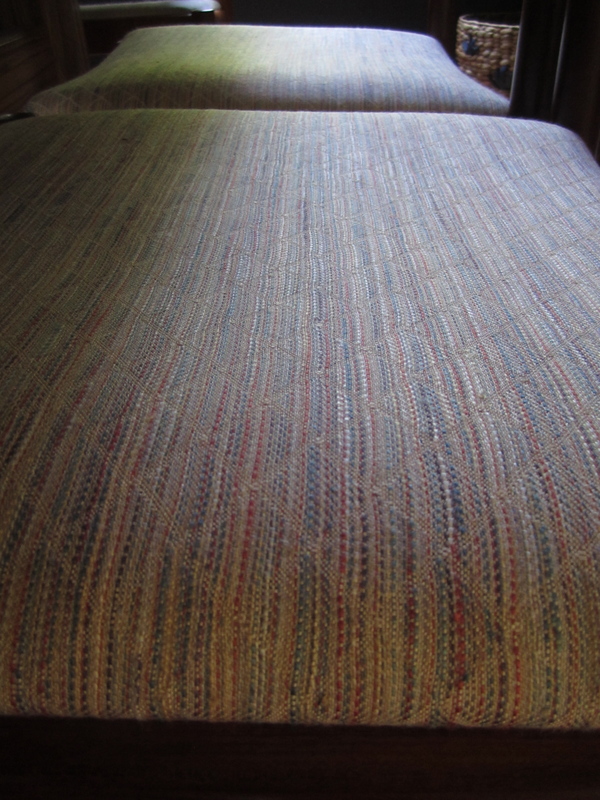 The seat coverings were soiled, so I recovered them in upholstery fabric I got at a local store called Econo Sales, which sells upholstery and outdoor fabrics for really cheap. 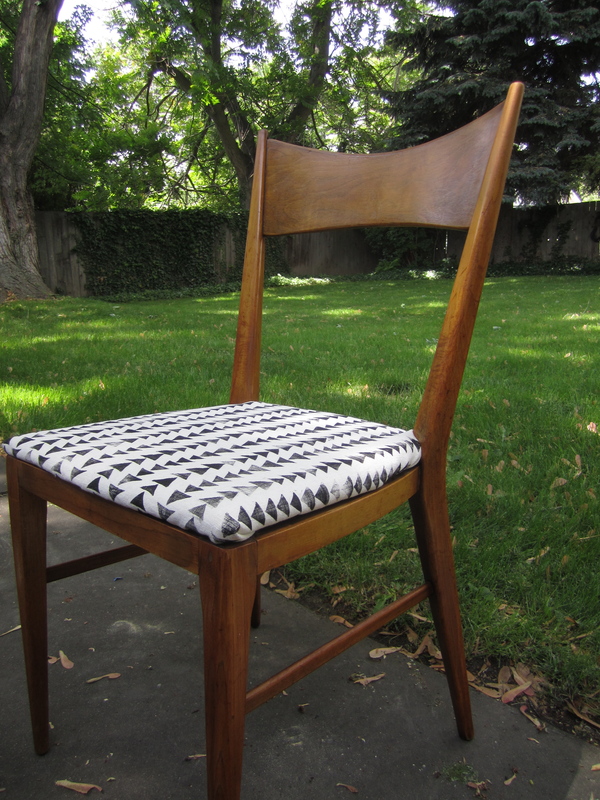 Mine was only $6.95 a yard (with a width of 54″), so it was an inexpensive makeover – less than two dollars per chair. Initially I’d planned on something monochrome or dark, but ultimately decided light fabric would play better with all the wood and dark paint. The runner is from World Market but I added the tassels. As I do. 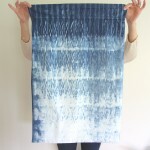 The pattern and texture of the fabric are subtle, but really pretty in person. I decided to forgo curtains entirely. I love the old original windows and they look into two evergreen bushes – a rhododendron and a camellia – and across our driveway into a laurel hedge (also an evergreen), so privacy isn’t an issue. They are east-facing so there’s no afternoon glare, and I love the natural light that moves through this room during the day. Whyyyyyyy is that light fixture so far off center? No really, why? I’m hoping that when Cameron and I are back for good at the end of summer we can fix it. The vintage cast iron light was an eBay bargain last fall. When it arrived it was rusty and sticky with many coats of gold spray paint and the slurry of a thousand cigarettes smoked beneath it. We had it powder coated, and if you live in or near Eugene and have a need to get anything powder coated, send an email and I’ll pass on the guy’s name. It was cheap – like $20 – and he was really helpful and nice. Any guesses on how many times I bumped my head on that light while I was painting? Did you guess 100? Well you are wrong! It was only 20, maybe 30 times – luckily it’s a small enough room that I couldn’t get up enough momentum to really brain myself on it. 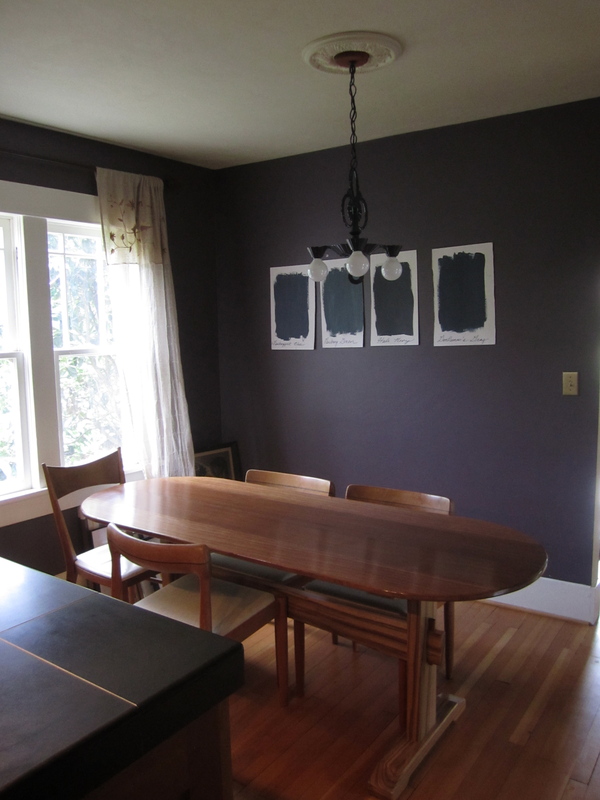 Getting the dining room to a good place has inspired me to start thinking about painting the living room too. I’d like to go lighter in there – it’s still the green it was when me moved in – and I’m on the hunt for a white or light gray that’s not too yellow or blue or dingy or stark. You know – no problem. If you have any recommendations I’d love to hear them! Thanks for reading along and we hope to see you back on Wednesday for a new post! Anybody else do some home improvements this past week? I am really excited to share this project with you, both because it has been on my to-do list for a while and because I had a lot of fun doing it. 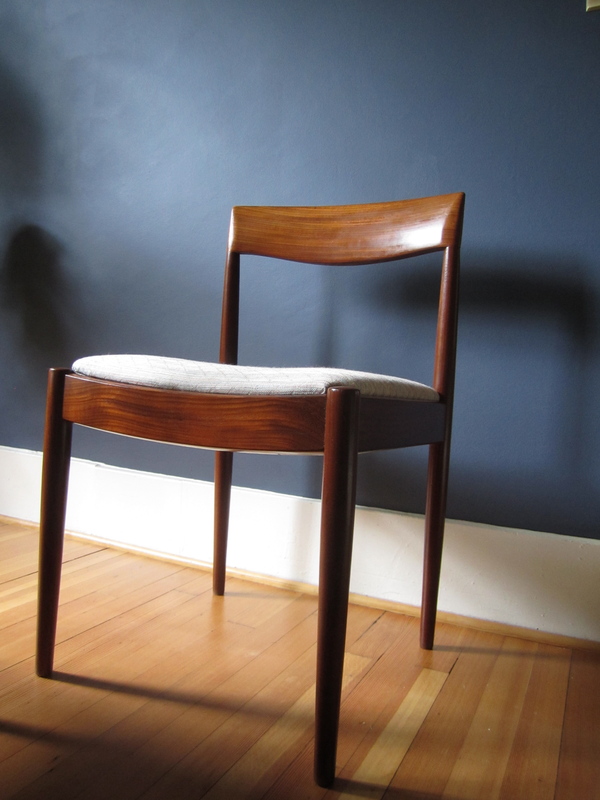 I found this Paul McCobb dining chair over a year ago, and it is responsible for setting my thrift store expectations way too high–I consider it my gateway drug for compulsive thrifting. I found it in a corner of the thrift store, not with the other furniture, but with the washers and dryers. 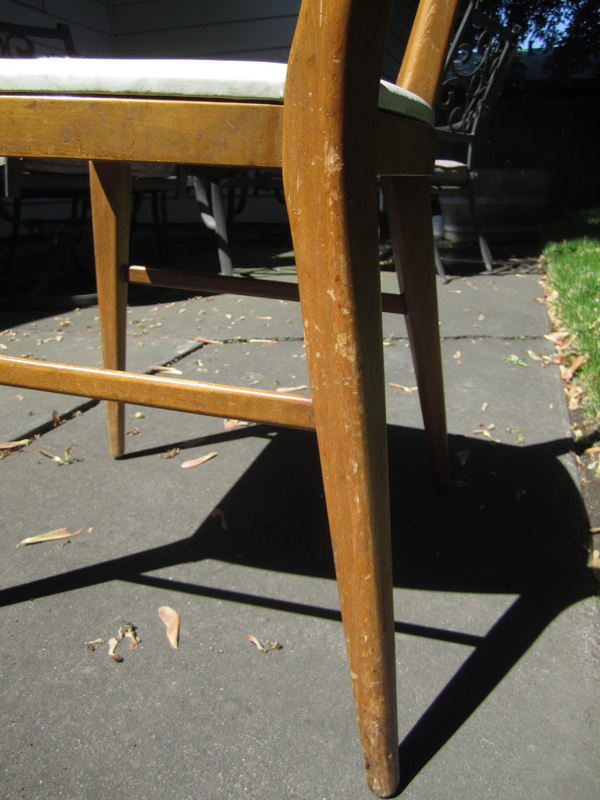 I didn’t know who Paul McCobb was at the time, but I knew I loved the angles of this chair. And even though it was in disrepair, I brought it home. For $1.99. I need to point out, right up front here, that the following series of pictures are taken outdoors because I’m not, in fact, currently residing in my red house west. This summer – for work – Cameron and I are living mostly up in Washington State (in Walla Walla specifically – if you know the area and have recommendations, please tell me in the comments! ), and we have friends living in our house. 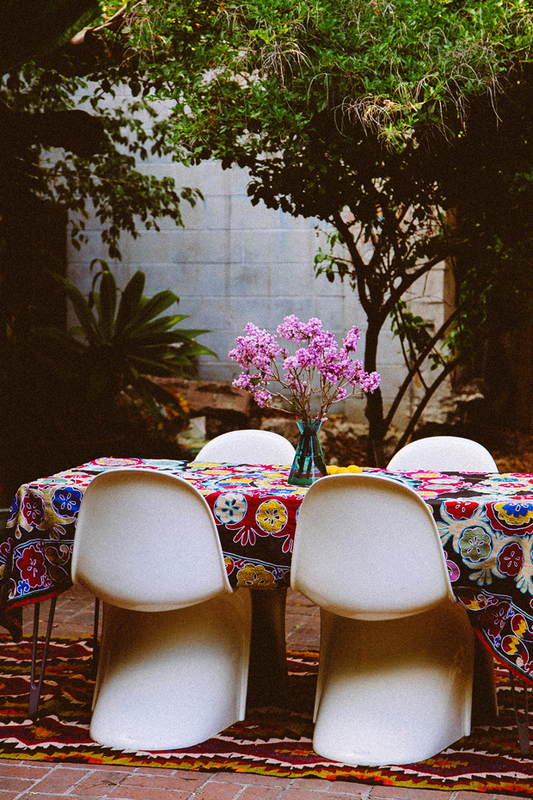 This is mostly a good thing – I’ve always loved moving and living in new places – and spending a few months in a place is a great way to get to know it without worrying whether you’ll still like it in a year, or five or ten. I am missing our house, though, and my fevered house project brain can’t rest, so I’ll be sharing a few smaller projects then heading down next month for some frenzied (blissful!) painting and home repair. Back to the chair (which I loaded into the car on top of all the other things we moved here with while Cameron looked on askance). Structurally, it is in good shape. No wiggles or cracks in the wood. However, it looked like somebody used it as a notching post to record the passing years of their life in exile–there are cuts and gouges all over the finish. 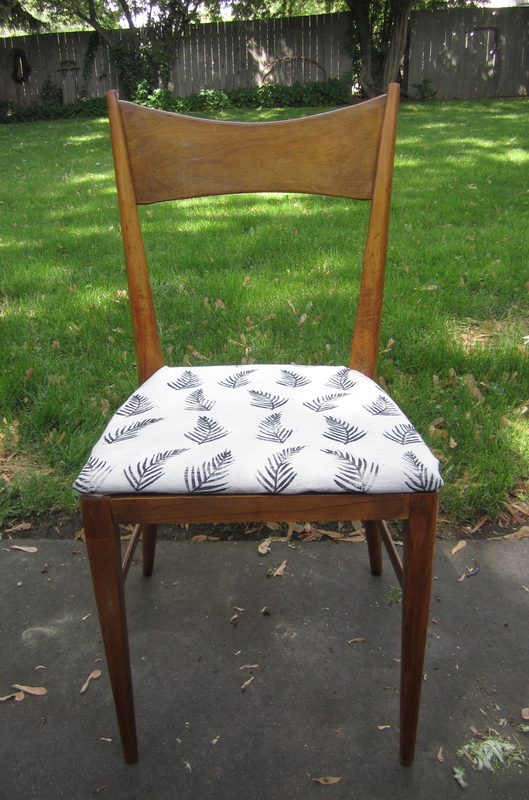 I knew I wouldn’t be able to make this chair look like new, but I did know I could make it a lot better. I washed it down with wood soap, gave it a light sanding, then pulled out my favorite one-two punch of Restor-A-Finish and Howard Feed & Wax. 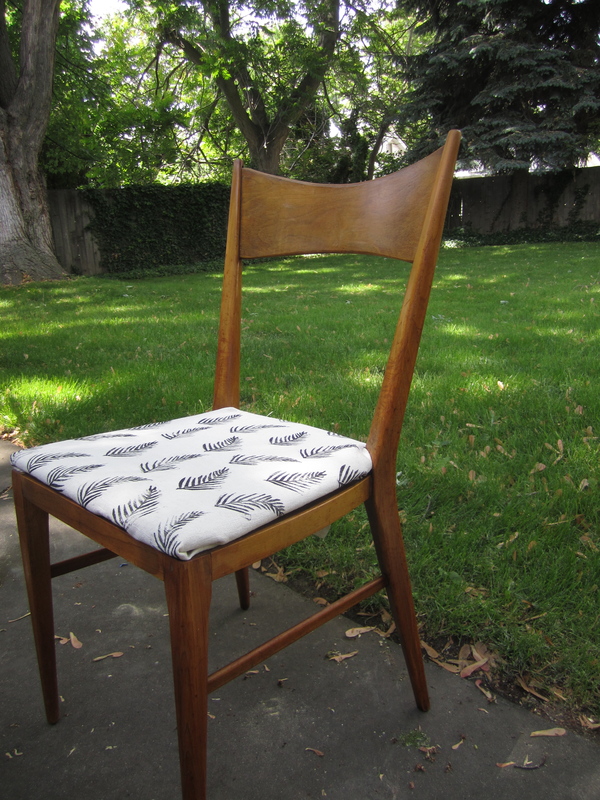 The cushion on the chair was torn and beyond repair and, as with the upholstered stool I shared here before, I knew I wanted to try printing my own fabric. 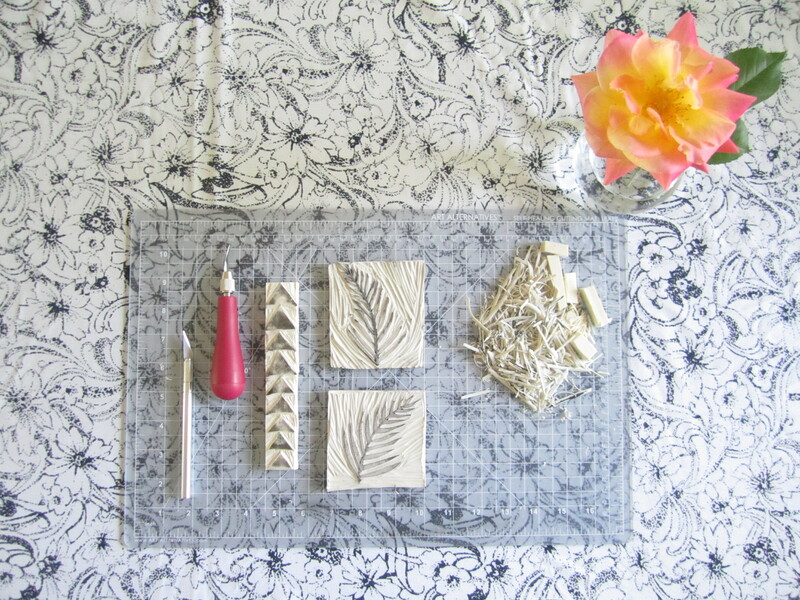 To make the stamps, I used a soft rubber carving block I got at the craft store and Speedball carving tools. I doodled some possible designs and then used a pencil to draw them freehand right on to the carving block. 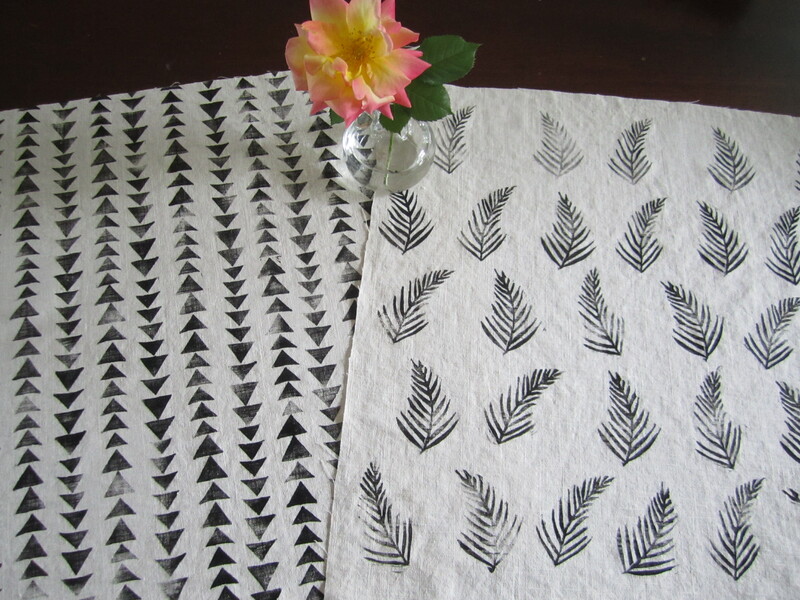 I tested them, first on paper and then on fabric, carving away any raised areas that were marring the printed image. 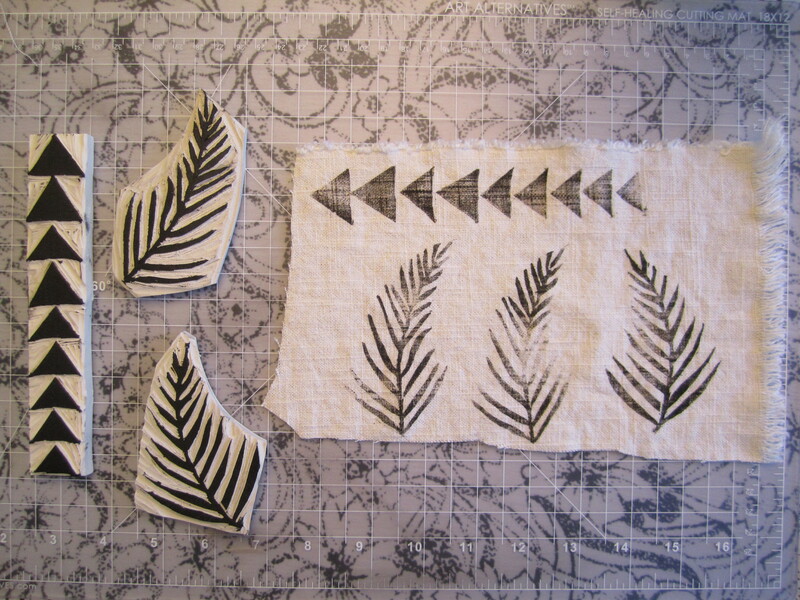 I ended up cutting out the fern stamps (rather than leaving them in a square shape), so I would have an easier time orienting them on the fabric as I stamped. I set up a printing station on the floor (doing this type of project in a rental house posed some challenges — I didn’t have a dropcloth or any newspapers, so I tore sheets out of a catalog to protect the floor). 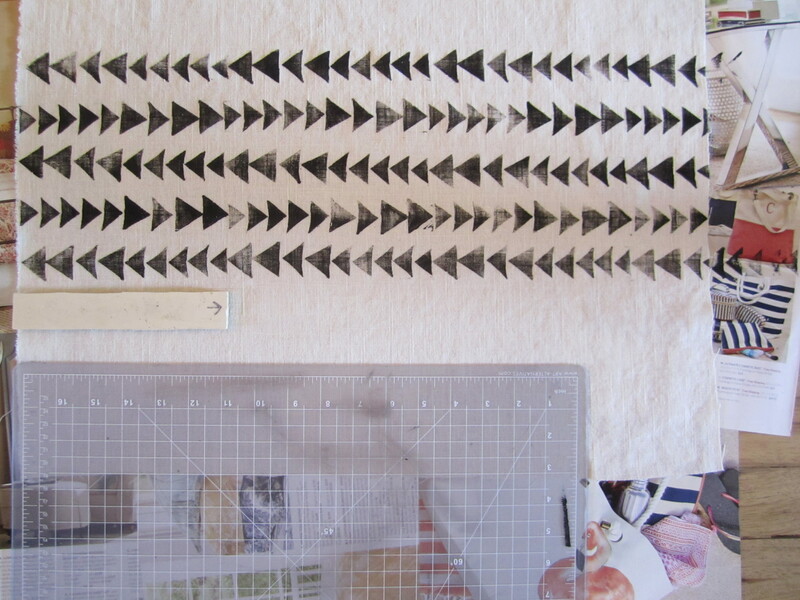 I used the ruler on my transparent cutting mat to help keep the lines straight. The triangle print took a while. For expedience, I wish I’d carved a block with four columns of triangles instead of just a single one. Overall though, it was an easy process. I put on a podcast and happily printed away. The ferns went much faster and though I started with a measured grid carefully marked in pencil, I quickly abandoned that and just eyeballed the spacing. Now here’s where I need your help! 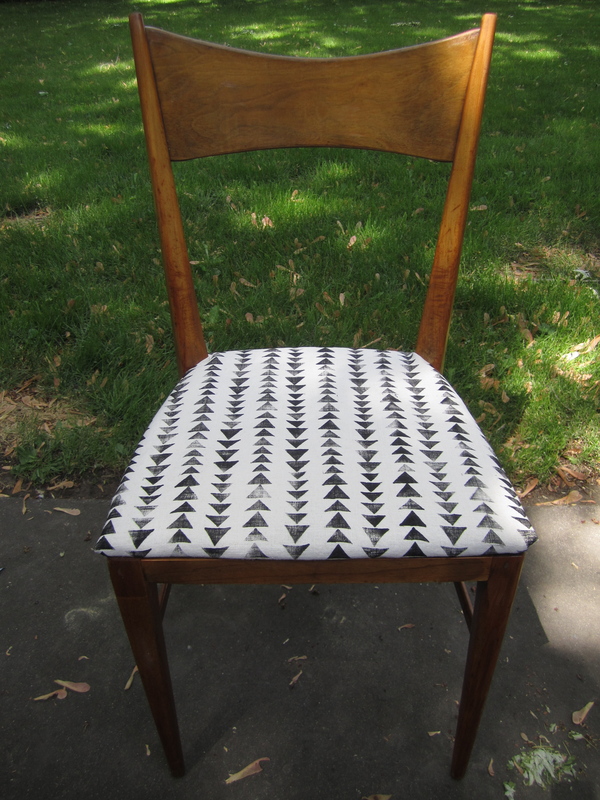 I can’t decide which print I like better on the chair, the botanical one or the triangles. Please take a look and cast your vote! Whichever one I don’t use, I will make into a pillow or find another use for it. Cast your vote and I’ll finish ‘er up and take some photos when I’m back in my red house next month. 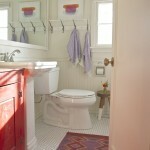 Thanks for reading this post and for weighing in on the design decision! You’ve still got two days to be entered to win the Good Score giveaway–we’ll announce the winner on Friday! Katie and I are meeting in Seattle this weekend for a quick getaway and blogging caucus. 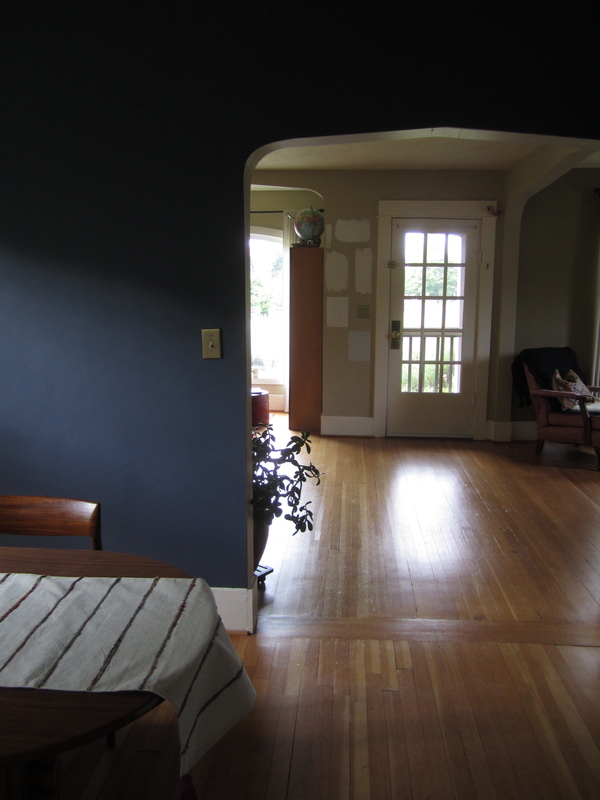 We’ve rented a little apartment with a view, and we are going to work on our plans, vision, and hopes for Red House West. 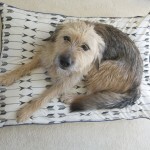 Apart from the blog, we have a few specific tasks in mind, including the compulsory clothing shopping that has to happen anytime an Alaskan goes to Seattle, eating great food, and looking for treasures in thrift stores. 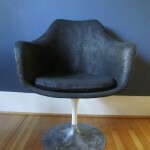 I also have one very specific mission that I’m hoping to accomplish: test driving/sitting the Panton S chair. 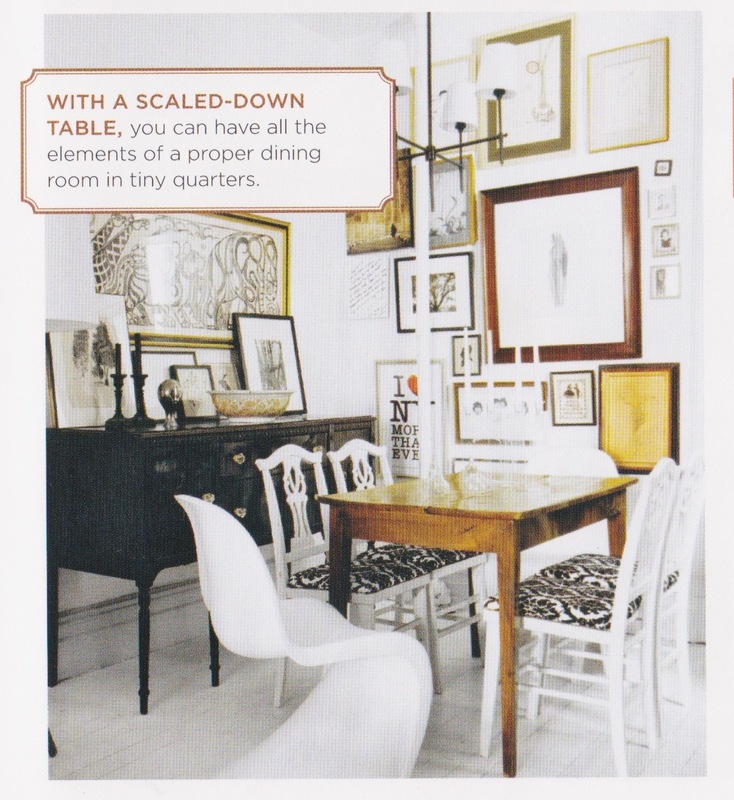 Decorator Lili Diallo’s dining room from the pages of Domino: The Book of Decorating. I’ve been waffling about this chair for ages. 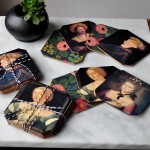 I love everything about the way they look and I think they would go a long way in helping me to achieve the eclectic mix of styles that I crave. My house is laden with old things, and I need the zesty punch of a new era to lighten things up, give the space a sense of humor, and turn the dowdiness into WOWdiness (boom! that just happened). 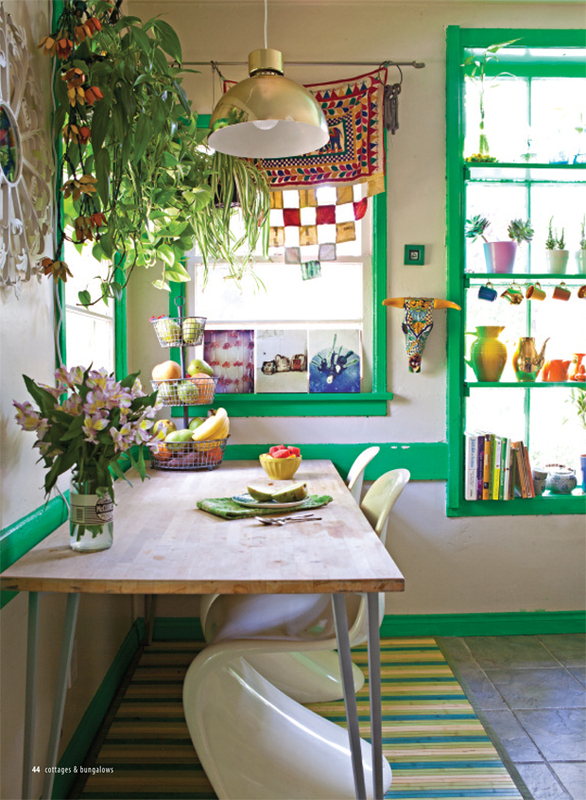 From the queen of bohemian decorating, Justina Blakeney. Another example from Justina Blakeney. I’ve never sat in one, (or seen one in person) and I haven’t pulled the trigger for fear that they are uncomfortable, or that they feel like flimsy lawn furniture. So I’ll be scouring the city for the elusive Panton S, and I’ll give you a full report here soon. Another example from Domino: The Book of Decorating. 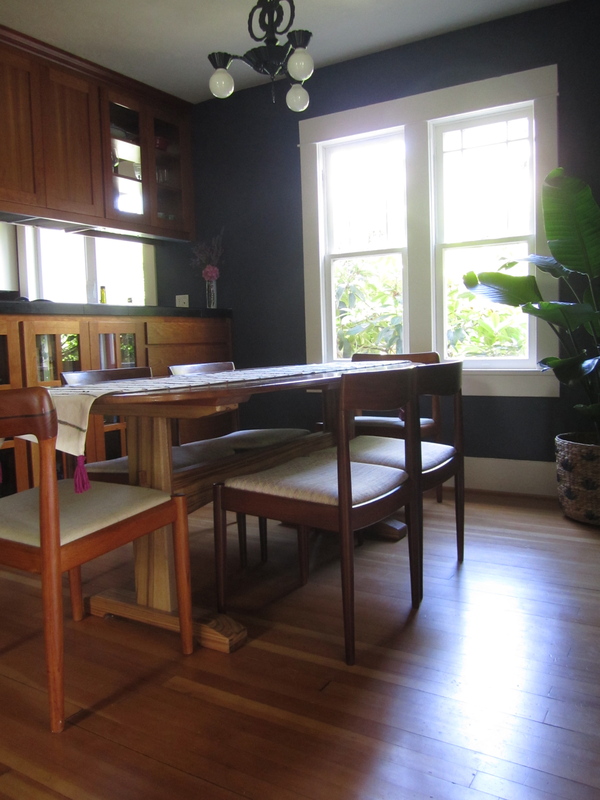 My parents gave me their old dining chairs–intricately carved and perfectly mismatched wood chairs from Mexico. I love them, and, as in this photo, I think a few Panton S chairs in the mix would set them off perfectly. 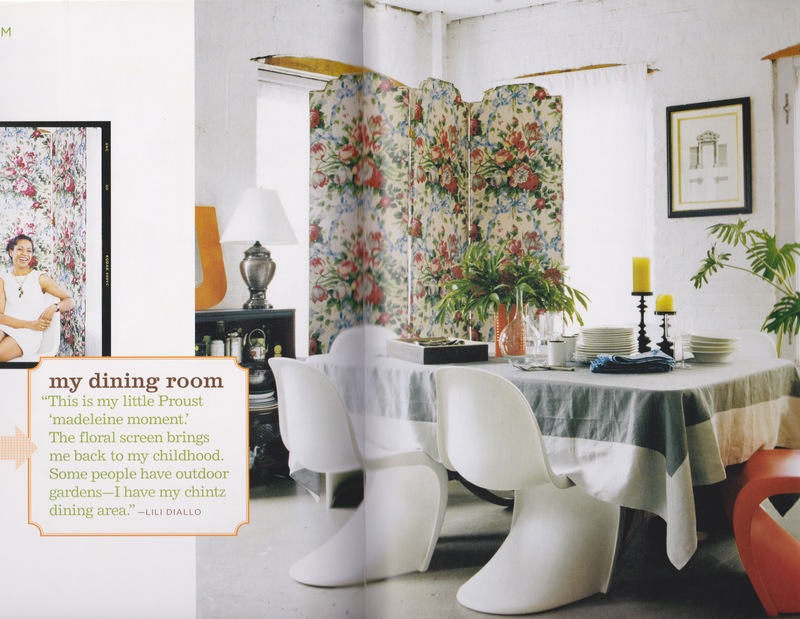 Panton S chairs in an elegant setting by The Brooklyn Home Company. In the meantime, look forward to some spectacular Good Scores! on Friday. Next week we’ll post about our Very Important High Powered Blogger Conference, and I’m certain that in the coming weeks we will be imbued with a sense of passion and purpose–can you feel it already? Who knows, I might even be blogging my brains out from my new Panton S chairs. Any thoughts on places we can’t afford to miss in Seattle? Thrift stores you love? As always, thanks for reading and supporting Red House West!